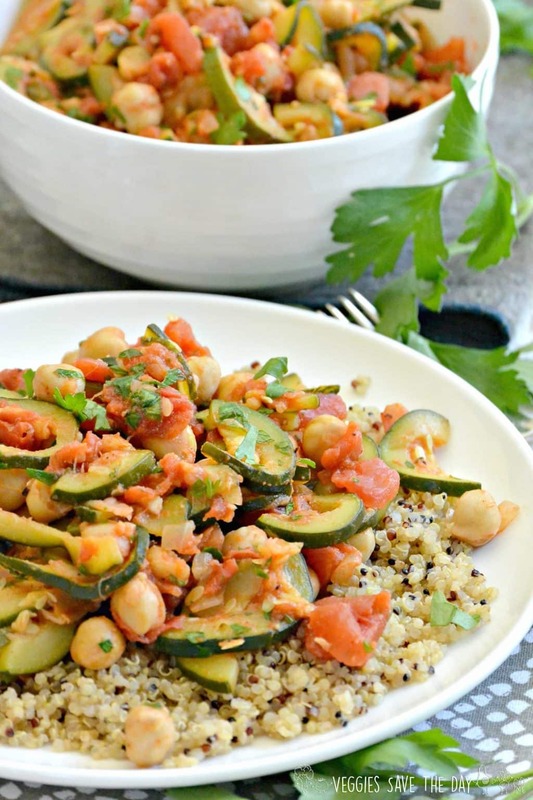 When summer squash is in season, make Zucchini Chickpea Stew! It’s vegan and gluten-free, with an oil-free option. And it’s delicious hot or cold! Every summer I feel like we all end up with more zucchini than we know what to do with. Whether we buy it on sale at the supermarket or local farmers market, or grow it in our garden, there is always so much summer squash! Some people like them spiralized and made into zoodles for salad in a jar or instead of spaghetti with avocado basil pesto pasta. Plus they are delicious in a simple Pasta with Zucchini. And, of course, they are an important component of Roasted Ratatouille. But my favorite way to eat them is in this Zucchini Chickpea Stew. 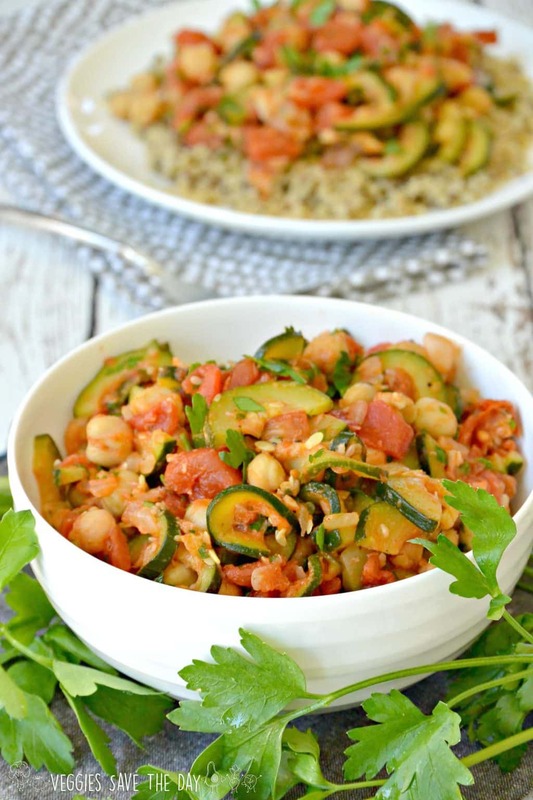 Zucchini Chickpea Stew is delicious served over quinoa, rice, pasta, or baked potatoes. I love building a meal around a grain, a bean, and a vegetable. It’s such a classic combination, not to mention very healthy. This stew includes the bean and vegetable, and you can serve it with whatever grain you have in your pantry or leftover in the refrigerator. It’s such an easy meal to throw together! You may already have all the ingredients you need on hand to make Zucchini Chickpea Stew. For added flavor, all you need is salt, pepper, and smoked paprika. Smoked paprika has a different flavor than the regular sweet paprika you may be familiar with. The latter is used a lot for color and has a mild taste. I think once you try smoked paprika, you’ll enjoy adding it to your favorite dishes for a bolder, smokier flavor. Keep in mind that a little goes a long way. I use it to make a Sheet Pan Dinner with Broccolini and Chickpeas, Smoky Kale & Chickpeas, and walnut and mushroom meatballs in Rasta Pasta. Zucchini Chickpea Stew can be made ahead of time and either reheated or eaten cold or room temperature. I like to make a big batch on the weekends to enjoy during the week for quick lunches or dinners. And as I mentioned earlier, it’s a great way to use up any extra summer squash you have. 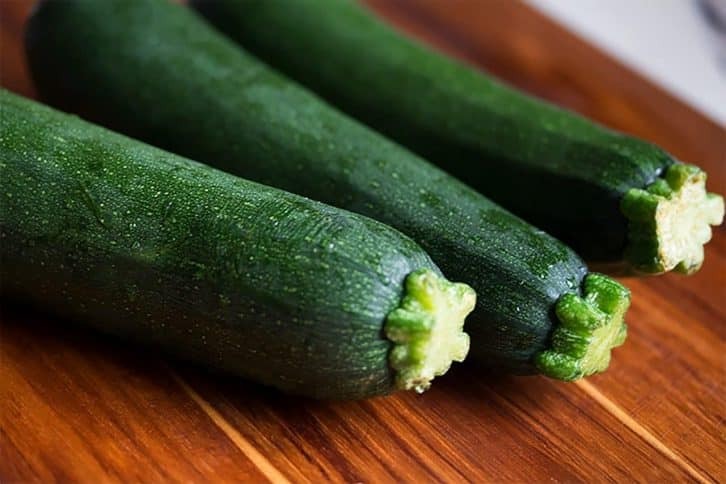 By the way, did you know that zucchini are called courgette in many countries? What do you call these squash? Either way, I call them delicious! Now let’s make Zucchini Chickpea Stew! Zucchini Chickpea Stew can be eaten hot or cold. Try it over quinoa or your favorite grain for a complete meal. Heat a skillet over medium heat and add oil, if using. Saute the onion for a couple of minutes until it's translucent. Add the zucchini. Saute, stirring often, until the squash has softened and is lightly browned. Add the can of tomatoes and their juices, the chickpeas, and smoked paprika. Stir and simmer until heated through. Serve over quinoa, if desired. You can make this recipe ahead of time and enjoy it later for quick lunches or dinners. I prefer to make quinoa in an Instant Pot (electric pressure cooker). Combine 1 cup of rinsed quinoa with 1 1/4 cups water. Cook for 5 minutes, then let the pressure release naturally. You'll be left with perfectly cooked quinoa every time! Oh wow! This looks like a great way to take advantage of zucchini season! Thanks Becky! It’s a really affordable meal! I also love making big batches of food and then eating cold leftovers – I often think the leftovers are even better than the first night! Thanks Sarah! I agree, the flavors are even better the next day! Thank you, Matt! It’s a really easy and nutritious meal. This sounds so good. I’d love to trade you some of your spare zucchini for the massive abundance of yellow plums and strawberries that I have in my garden right now! What a pretty dish! I’ll grab some zucchini at the farmer’s market! I love adding smoked paprika to a dish for that extra kick of flavor! This sounds like the perfect summer meal served cold. Thanks Marlena! Yes, it’s such a great spice! I think you put together one fabulous summer meal! All the zucchini all the time for me! We don’t have a garden, but like you, we always end up with a bunch of zucchini in the summer. This sounds like a great way to use it! Thanks Cadry! It seems like everyone is always ending up with more zucchini than they know what to do with! I really liked this recipe, I had leftover zucchini and squash and tried to find something to do with it and this really worked out well. I added more smoked paprika because I really liked it in this dish. I’m so happy you enjoyed it, Miko! Smoked paprika is such a great spice. I’m glad you enjoyed it, Joanna! I’m happy to know it was still tasty with regular paprika. A very light dish but it wasnt saucey enough. it tasted a bit dry! So i added lemon juice and himalayan salt to give it some flavor. Thank you, Lydia! Yes, the 1 cup of quinoa is included in the nutritional information. Thank you, Anna! I’m happy you enjoyed it! I made this tonight, thought it was pretty tasty, but my father said it lacked flavor. He’s been a meat, bread and potatoes kinds of guy forever and recently gone vegan with me for his health, and let’s just say old habits die hard. I made some garlic toast sprinkled with nutritional yeast as a side for this, and loved it all!! I think it takes a while for the taste buds to change. That’s fantastic he has gone vegan with you! I made this with regular papika but I want to make it again with the smoked. I’m glad you enjoyed it, Rosalind! Delicious! I just made a double batch and it is sooo good! I added just a touch of Badia complete seasoning, but otherwise made it exactly per the recipe. It was a hit! Will be making it often. Thank you for this recipe. Thanks so much, Ana! I’ll have to try some of that seasoning! It looked too basic for me and to be honest, I did not expect a lot. However, I did not have choice, because the ingredients were the only one in my fridge. Even had to take butter beans instead of chickpeas. However, I was surprised by the taste of this dish! It was really really lovely and it is now on my -make it again- list. Again, amazed by the fact that with a minimum of ingredients, to have this nice dish! That’s wonderful, Diana! I’m so happy you enjoyed it! I made this last night. It was delicious! Thanks for the recipe. I grew Globe Zucchini this past summer by mistake in my home garden & still have some left (different sizes). This recipe sounds great & will definitely make it soon. One question though, what is the measurement for the zucchini, 1 or 2 cups or? Since I have globe zucchini, I’m not sure how this measures up to the traditional long ones. Thank you for sharing. Hi Donna, I would use 2 cups of sliced zucchini for this recipe. I hope you enjoy it! Do you k owning this will freeze well for a later date? I am batch cooking for my sister in law who just had twins! How wonderful! Yes, it freezes well, and you can also freeze some cooked quinoa to go with it.